Click the image to enlarge it. Infographic: dou.ua, translated by Euromaidan Press. In October, DOU.ua polled 1,633 IT specialists who had moved abroad. 90% of participants were former residents of Ukraine. Here are the findings of the poll. The majority of IT specialists who have left Ukraine currently live in Poland (26%), Germany (19%), the USA (13%) and the Netherlands (6%). This is according to the results of a survey from DOU, popular Ukrainian portal for Ukrainian IT professionals. In the previous 5 years, the tendency of experienced and qualified IT specialists to leave Ukraine has only grown. The majority of those who responded to the questionnaire left Ukraine not long ago: 19% emigrated less than a year ago, 38% have lived outside the country for between 1 and 2 years, and 35% left between 3 and 5 years ago. Only 8% of participants in the survey left Ukraine longer than 5 years ago. Infographic: dou.ua, translated by Euromaidan Press. 47% of the respondents who left more than 5 years ago have not yet reached 25 years of age. 16% of them are still studying or are studying while working, and 12% did not work in IT before they left Ukraine. Thus they were either students, or had just begun to work. Among those who left less than 5 years ago, only 24% were younger than 25 years of age. The largest age cohort of those who left Ukraine in the last 5 years consists of people between 26 and 30 years of age (42% of respondents). Those between 31 and 35 years old form nearly a quarter of the respondents. Only 6% are still studying or began to work only after leaving the country. Only 2% began to work in IT only after leaving the country. 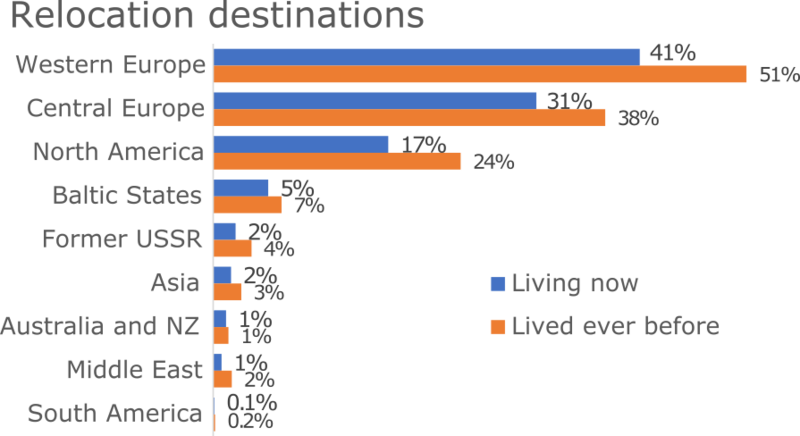 Of those who left longer than 5 years ago, 70% actively and independently searched for means to emigrate, and of these, about half (34% of the overall sample) were relocated by the companies they worked for. This influenced which countries the IT specialists moved to: of those who left longer than 5 years ago, most left for Western countries – the USA, Germany, or the Netherlands. In more recent years IT specialists have emigrated primarily to Central Europe: Poland mostly, followed by Lithuania and Estonia. The principal reason for leaving has been revealed to be a desire for a peaceful and secure life for oneself and one’s family (62%). The second most-frequently cited reason was a desire to live in another country and another culture (58%). Only 5% of respondents had a strong desire to return to their homelands. 19% of those asked said they definitely would not return to their country and 42% would prefer not to return. 26% had not decided whether or not to return. More than 90% of the respondents are IT specialists from Ukraine, but among the remaining less-than-10% are some IT specialists from Russia, Belarus, Kazakhstan, and Uzbekistan.